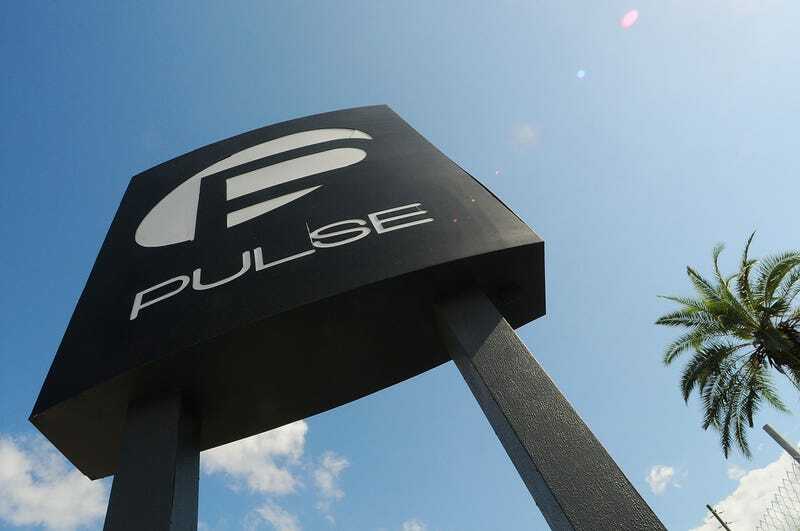 A view of the Pulse nightclub sign June 21, 2016, in Orlando, Fla. The families of some of the victims of the Orlando, Fla., nightclub shooting have filed a lawsuit against Google, Twitter and Facebook, arguing that the tech companies had a role in the radicalization of the shooter. The gunman, Omar Mateen, did not appear to have official ties to the Islamic State group, also referred to as ISIS, but the terrorist organization appeared to have inspired the attack at the Pulse nightclub. According to the Washington Post, the families are accusing the tech companies of providing support to the Islamic State, saying that the group’s indirect influence over the gunman is partly attributed to its ability to recruit fighters on social media. “Without … Twitter, Facebook, and Google (YouTube), the explosive growth of ISIS over the last few years into the most feared terrorist group in the world would not have been possible,” the lawsuit, which was filed in a Michigan federal court on Monday, reads. This protects companies like Facebook, Google and Twitter from being held responsible for things members of their services post. They are only providing the space for people to share their thoughts, but they cannot be held liable for the thoughts that people share; they have no control over them. According to the Electronic Frontier Foundation, this has created a space where individual users are held responsible for their own conduct in online platforms. A lawyer representing the victims’ families told the Post that Monday’s filing contains a new claim that no other lawsuit has tried before; it alleges that tech companies create new content that does not benefit from Section 230 protection when advertising is coupled with an Islamic State supporter’s online posts. “While they didn't create the ad, and they didn't create the posting, by putting those things together, they created specific unique content,” Keith Altman, an attorney at Excolo Law, said. Whether this argument will fare better than earlier ones remains to be seen, but courts generally don’t hold online platforms legally liable for the content of their users' posts. In a statement, Facebook said that it is committed to providing a safe experience for its users.